This design started in my head with the wire bird's nest. I then rummaged through my bowl of cast offs, wire pieces, and copper objects and found the steel, rusted washer, which I had picked up in a boat yarn last year. The stones were from a gem stone store in Charleston. So here it is. I did put some renaissance wax on the washer to keep any rust from coming off on the clothing of the wearer. 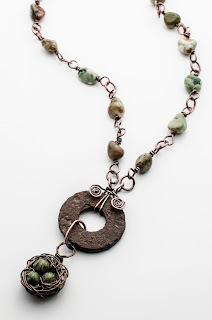 The 18gauge copper wire for the links was dipped in hot liver of sulfer for a nice patina.